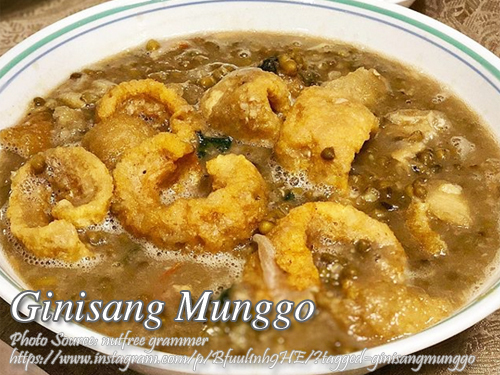 I think this is one of the most budget friendly vegetable Filipino dish because munggo or mung beans are cheap and when cooked, it expands, like cooking a congee or lugaw. It also easy to cook this dish. Actually the name of the dish ginisang munggo, if you will take it literally, the dish should look like stir-fried. But when you see the finish product when cooking this dish, it looks like stewed mung beans. Anyway there is still some stir frying of the ingredients in the procedure, stir-frying the pork and the aromatics before turning it into a mung beans stew. There are many variation of ginisang munggo, some version use tinapa fish flakes or fried fish flakes, alugbati and bitter gourd but my favorite version is this one, with lots of chicharon or pork cracklings and with the ampalaya leaves. You can also add some shrimps if you want to make it tastier. But I think using shrimp bouillon or dried shrimps will work just fine. Rinse the mung beans in running water. In a pot, put the mung beans and water. Bring to a boil and cook until the beans are tender. About 45 minutes. In a wok or deep pan, heat oil and stir fry the pork until brown. Set aside. Saute garlic and onion until fragrant. Then add the tomatoes and saute until soft. Mix the pork and add the patis and simmer for a few minutes. Add the cooked mung beans with the liquid and stir. Add the bitter melon leaves, pork chicharon and cook for at least 5 minutes more. Serve hot.